If there is one “hot button” topic in the M.U.S.C.L.E collector community, then it is the “Super Rare” figures. 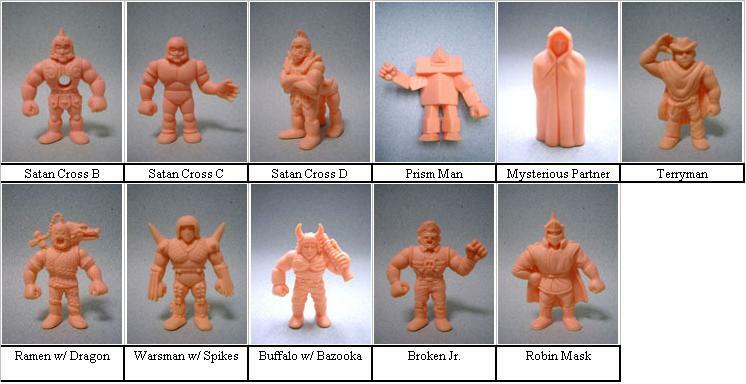 Because these “Super Rares” do not appear on any poster, marketing material, or as an exclusive figure with any M.U.S.C.L.E accessories their authenticity has often been debated. Their limited appearance coupled with appearing primarily in the flesh color further flames the fires of debate. The appearance of four colored Super Rares has only muddied the waters ever further. Because of these reasons some people will only acknowledge the Super Rares as authentic when they are found in their original sealed packages. Who are the “Super Rares”? Satan Cross (SC): The Satan Cross actually comes from a 2-piece Kinnikuman figure originally released in Japan. Mattel had a distribution deal with Bandai which allowed them to release toys manufactured by Bandai. Unfortunately Mattel did not release the second half of Satan Cross, which left the figure with a mysterious hole in his back. This is the only Super Rare that can be classified as 100% authentic. SC has been found in sealed 4-packs. Unfortunately his rather frequent appearances on eBay suggest that he shouldn’t be considered a Super Rare. Instead SC should be considered a “Super Desirable.” Click on How Much is SC Worth for more information about SC. Spinning Head Ashurman (SHA): This figure has been found both missing his head and with his loose head. SHA has been found several times, although a decent guess would suggest that the M.U.S.C.L.E community knows of about 5 figures. Black Hole Sunshine (BHS): This figure has been found missing his plug, with his plug detached and loose, and with his plug never removed – still attached to his side. This is a variant of figure #3 on the M.U.S.C.L.E poster. BHS has also been seen several times, again the M.U.S.C.L.E community knows of about 5 figures. Drunken Master (DM): There is only one know example of this figure. His exclusivity encourages more questions about his authenticity. However he appears to have the appropriate smell, color, rigidness, detail, and texture to be an authentic M.U.S.C.L.E. Further discoveries of this figure will only aid in the confirmation that this is an authentic M.U.S.C.L.E. Dark Emperor (DE): Again there is only one know example of this figure. And again he has all the qualities that would suggest he is an authentic M.U.S.C.L.E. This amazing group of figures was found on Yahoo Japan by the owner and operator of www.LittleRubberGuys.com, Jon Karis (jkaris). He felt that these figures belonged to the community so he broke the set up, selling figures to various members of the M.U.S.C.L.E. community. There is only one known example of each of these figures. These five figures were found by Alex Forbes (arforbes). First he found the flesh Dr. Bombay in a regular eBay auction. The red Geronimo followed in the same way. Finally the three blue figures were found in a Yahoo Japan auction. Yet again, this is the only known example of this figure. He appears to be 100% legitimate. This is the only red Super Rare figure, and only one of four colored Super Rare figures. This is the first of three blue Super Rare figures. This is an especially interesting discovery. While it was found with the other blue figures, it shares the same sculpt as the flesh Robin Mask. In my opinion, these two Robin Mask figures add credence to the Final/Next Wave Theory. This is the third blue Super Rare figure. NOTE: I'm not 100% sure where the Flesh SR pictures are from. I took them from my checklist, and I don't remember where I got them. If anyone knows, then please let me know. I'd like to give full credit. I know the Color SR pictures were taken by Alex, but again I'm unsure if they are from a site. I'd be more than happy to give proper credit.